Esaunggul.ac.id, Esa Unggul formed Student Boyscout Front Movement. 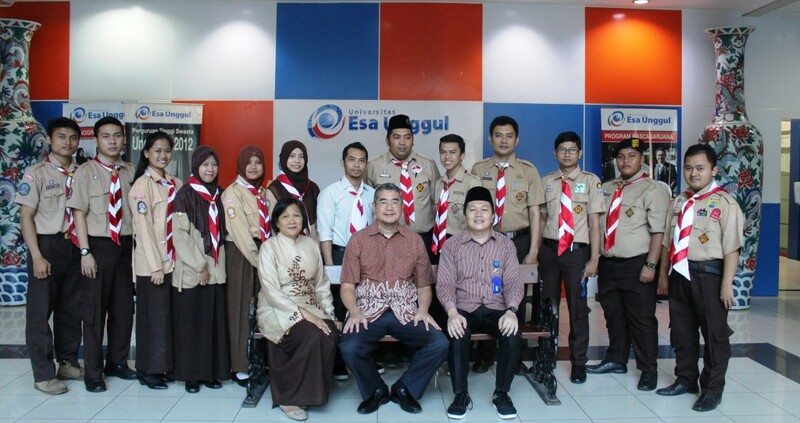 Wednesday (14/06) yesterday at the rectorate room and also the community that supports the formation of boyscouts held an audience with the Rector of Esa Unggul University Dr. Ir. Arief Kusuma AP, MBA. In the hearing, Arief supported the formation of the boyscout front movement because this activity was a positive thing and was able to improve the spirit of leadership and youth among Esa Unggul students. “Amidst the current flow of modernization which is currently very strong influence, youth movements such as boyscouts should appear to be an oasis for the youthful souls of our young generation,” Arief said, at the Lobby of the Main Building of Esa Unggul University, West Jakarta, Wednesday (06/14) 2017). Arief also asked that in the future this boyscout movement could be followed by Esa Unggul students despite many intra and off campus activities owned by Esa Unggul student. “This is a very positive activity for our students, even though many of our student activities such as seminars, campus organizations, I’m sure this Boyscout Movement can be sustained” he explained. SMeanwhile, Alex Gufron, Head of Esa Unggul Boyscout Front Board, explained that the establishment of Esa Unggul Boyscouts had actually been through a very long process in previous years. due to the lack of human resources and supporting infrastructure, it was only in this year that initiators formed Esa Unggul student Boyscout front groups. Many are asking, why is Esa Unggul Boyscout Movement didn’t start from last year. In reality, the plan was formed last year, but only this year the human resources and infrastructure for boyscout activities are available and in our opinion it is sufficient enough to support the activities,” he explained. Alex also added that the activity of the Boyscout Front Movement Movement was also because one of the Elementary School Teacher Education Study Programs required the establishment of a Boyscout movement, so the campus also supported the formation of this boyscout movement. “Incidentally, the new Elementary School Teacher Education Study Program was formed requiring the existence of Scouting activities on campus, so we utilized this moment as a way to smooth out the forming of Esa Unggul student Boyscout activities,” he explained. He also hopes that students can enthusiastically participate in Esa Unggul boyscout activities later, for Esa Unggul students who want to join, they can contact Esa Unggul Scout representative, either himself or directly to the PKM (Student Activity Center) building. “For students from 2013 to 2016 who want to take part in the Scout Front group activities can contact me and scout representatives at the Student Activity Center Building,” he concluded.